Area of interest: To assist in preserving the walking dragline at St. Aidans former opencast site, near Leeds. To arrange visits to other sites with draglines or historical associations. Publications: Newsletter - 4 issues a year, plus occasional Specials. Archive collection: Small collection relating to opencast coalmining only. or access controlled: By appointment and on Open Days (details on internet site). Although it is only open on a limited number of days per year the dragline is visible to the public at any time from the St Aidan's RSPB Reserve at grid ref SE 399 287, satnav LS26 8AL. Current projects:	 To conserve the 1200 tonne BEl150 Walking Dragline which is over 60 years old and develop a visitors centre. Publicity: Historical Fact Sheet available. Services:	 Talks and guided tours. Last updated: 27/03/2018	 The BE1150 is one of the few remaining examples of a large (greater than 1000 tons) Walking Dragline in western Europe. 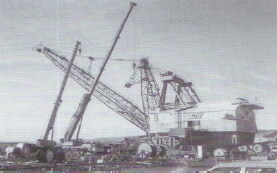 The first large dragline to be imported into the country from the USA was a BE (Bucyrus Erie) 1150B in 1948. It operated on an opencast coal site in Northumberland. Others were to follow, not just for coal sites, but at ironstone mines in the Northamptonshire/ Rutland areas. The St. Aidans BE1150 is not at present generally open to the public, but can be viewed from the road at Astley, between Swillington and Allerton Bywater to the south-east of Leeds, West Yorkshire at NG ref. SE 399 287. Visits can be arranged by contacting the Friends via the website. The photograph (by Ivor Brown) on the left shows the BE1150, known as 'Oddball' because of its unusual electric equipment, being prepared for its final walk in January 1999.